Outside her daughter's bedroom window, the apple tree was a cloud of white blossoms in the soft glow from the front porch light. Here on the second floor of their stylish suburban Boston house, Lacey slept with her nightlight on and her arms around one of her stuffed animals. At ten, Lacey clung to childhood, and Sophie was glad. 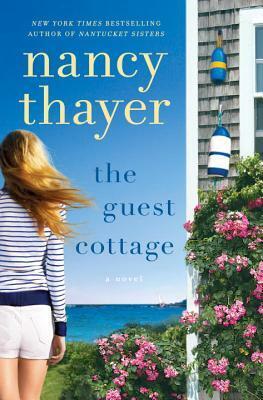 The Guest Cottage by Nancy Thayer is the perfect summer read. It was the book I read on the weekends while floating on a raft in the pool. I looked forward to this weekend respite each week. I loved Thayer's writing. It was simple, yet eloquent. Kind of like a soft summer breeze that pulled you into the story. Sophie is a comfortable in her life. She has has two great kids and her husband has built a successful architecture firm. She loves her children, she loves cooking, she's thankful that her husband can provide her with this life. But "comfortable" may not be enough and really should that be it for her? Faced with the dissolvement of her marriage, she decides to rent her friend's Nantucket home. The sun and sea will be great for her and her children. Meanwhile, Trevor is struggling with some of the odd behaviors his 4 year old son has developed since the death of his mother. An impromptu call from a friend who needs money offers the respite he needs. The sun and sea will provide a great distraction for Leo. Every summer since I started blogging I have been pitched a book for summer reading that is about a late thirties/early forties woman who is faced with divorce and runs off for a high end vacation for the summer to gain perspective on life and find herself and coincidentally find unexpected love. I kind of wonder about this theme. It that the fantasy of women my age, many who are going through divorce? It isn't my fantasy, but I've never been married. It would be great if there was a book about a never married late thirty-something who runs off to some fancy place for a vacation and finds love and it not be filled with the comedy of errors found in a chicklit novel, but rather a poignant tale of life and love. It is the poignant tale that drew me into The Guest Cottage and made it such an enjoyable read. It probably didn't hurt that it is set in Nantucket. I have always wanted to visit the New England coast. I loved the themes of friendship and passion (not as in romantic passion, but life passion). It doesn't hurt that there is a hot, wealthy, sophisticated European - the ideal man for a summer fling (at least in our dreams). And that is another thing about Thayer's writing that I really enjoyed, you could see yourself in Sophie's shoes. Very little of the story focuses on the fact she is getting a divorce at the end of the summer (probably because she is in denial about it most of the summer). Instead, she is have the dream/fantasy vacation that most only, well dream of. Even with the crazy cousins's mix up of renting the house out to people without letting the other one know, it was still an ideal vacation. Actually it was probably made better by Trevor being there. The story is as filled as the house they inhabit with friends and food. Really there was a lot of attention given to food in this book. I'm pretty sure Sophie prepared more elaborate meals than the average mother would while on vacation. I also found slightly comical the mentions of having fruit always available and putting out healthy munchies, so they wouldn't turn to chips. I do have to say though that mentions of the meals provided a fuller picture of the setting and it was the small details like this that helped draw the reader into the story. 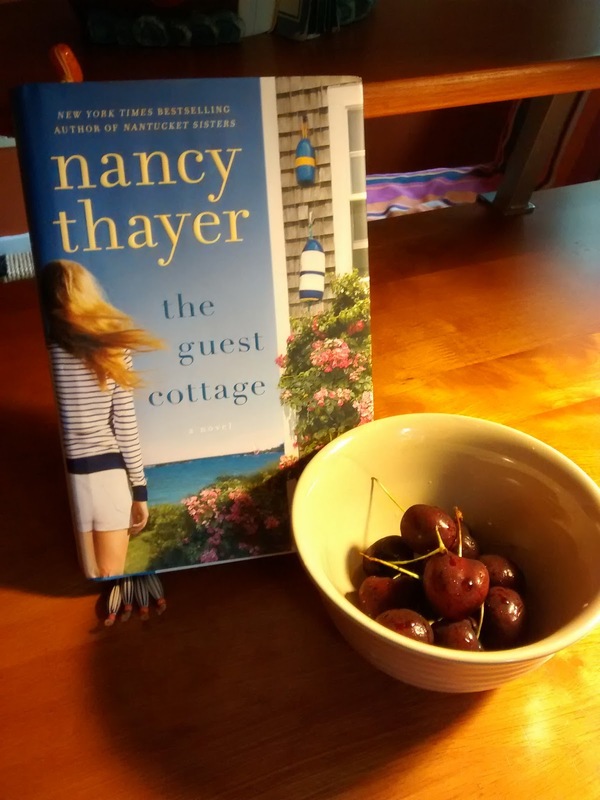 While I wasn't going to prepare any elaborate meals this summer, I did find a nice bowl of cherries to be the perfect snack companion for reading this book book. If you enjoy stories that deals with real issues but has a dash of fantasy life to them, then The Guest Cottage should be your next read. I would keep reading --sounds like a great summer choice and such a pretty cover. This sounds like a delightful story. I've read other books by this author and enjoyed them, so I'm sure I'd like this one too. 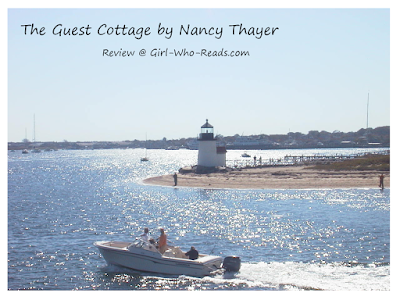 I loved The Guest Cottage, and like you, enjoyed those little details that brought me right into the lives of the characters...and into the fabulous setting. I love the way you described this one as "a soft summer breeze". I like the intro you shared and your review has me wanting to give the author a try. Love the opener and I have this on my list to read. Sounds like I need to read before summer disappears. Great first paragraph. I like Nancy Thayer's novels. I haven't read this one, so thanks for sharing it. Thanks for visiting my blog too. Nancy Thayer writes some nice summer-type books, even though not all of them are set in summer or at a lake or shore. Love the little teaser. Love the cover and the first paragraph so I would definitely keep reading. I have this book and definitely want to read it. It sounds wonderful.